Maggie and I have been taking little Vince to the town pool now and then. It reminds me so much of the days when I did that with the girls in Chicago. The sounds of splashing, children calling, moms visiting with each other. The wet, hot pavement, warm towels, ice cream from the snack window, his skin so cool and soft just dried off, floppy summer hats. Such a sweet time to share with them. He likes the water and I love to watch Maggie show him yet another new experience. So much love. Can't believe how fast he's growing up! I have a new sampler called West End. (That's Vince in the upstairs window.) It's in my Etsy shop now. 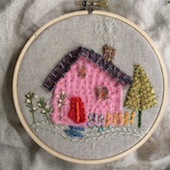 The roof was so much fun to stitch. Reminded me of the bargello needlepoints my mom used to make. And the colors are right from those dresses she wore in the 60's. Will forever adore those! Have to keep going and finish it up. Thanks for all the interest in the giveaway. Congratulations to the winner - Ann Clawson! Happy summer, friends! It's flying by, isn't it? Omg that's me!! Thank you so much, I'm so excited!! Little V is THE cutest. Looks like a sweetie too. Sun times, fun times. Yay for Ann! And your little guy is so sweet! My mom used to do those needlepoints too, thanks for the sweet memory- love the roof, the pattern and of course, tales and pics of Vince!